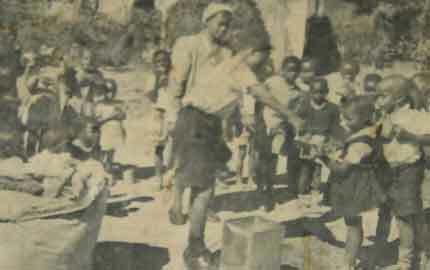 In 1945, Rabbi Moses Weiler, founder of the Progressive Movement in South Africa, was visiting Alexandra Township, where he noted the number of small children playing in the streets while their parents were at work. Realising the need for schooling for these children, he decided to find a suitable place to start a school, helped by his wife Una and Rita Marx (Hon. Life President of the United Sisterhood). Eventually a small, dilapidated four-room house was found to rent. Una Weiler and Rita Marx cleaned up the house, painted it throughout and brightened up the exterior window frames and doors with blue paint. A young teacher, Hilda Phahle, was employed at the rate of twelve pounds per month, and her first pupils were 36 children taken off the streets. She recalled smearing dung on the floors to keep the dust down and cooking meals for the children she had gathered off the streets. The school was named “Jabulani” meaning “Happiness”. The enthusiasm of Rita Marx, Una Weiler, Ethel Smith and Selma Gottlieb contributed much in the first years of the school’s existence. The Sisterhood continued to hold cake sales, jumble sales, bridge drives etc. to raise funds for the school. A dentist’s chair and dental equipment were donated to the school and a dentist, Dr Sergay, attended to the dental needs of the children on a voluntary and regular basis. Rabbi Weiler did much during these years to help raise funds for the school. Four years after the founding of the school rapid growth called for new premises. A plot of ground was bought and a small school with four classrooms was built by the United Sisterhood. Under the supervision of Hilda Phahle, by now principal of the school, there were now 110 children and two teachers at the school. 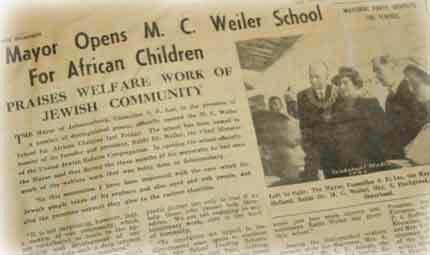 On January 2 1949, the school was officially opened by the Mayor of Johannesburg Mr SP Lee, and was renamed the MC Weiler School, in honour of Rabbi Weiler. By 1954, there were 266 pupils housed in 14 classrooms. Extra rooms were rented all over Alexandra and classes were held in old church halls, cottages and abandoned shops. 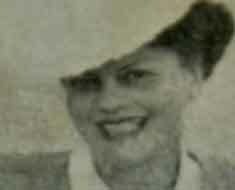 Hilda Phahle spent a good deal of time and much shoe leather supervising her scattered domain. In 1953, the Bantu Education Board took over all black education in South Africa. With the exception of the Roman Catholics, the Seventh Day Adventists and the United Progressive Jewish Congregation, all other church and religious bodies either handed over their schools or closed them. The few who resisted soldiered on without state aid. In Nelson Mandela’s book Long Walk to Freedom, he makes a point of referring to the MC Weiler school as one of those that did not willingly submit. Sadly, this was not to last. In 1955, the Bantu Education Board forcefully took over ALL black education in South Africa. The MC Weiler School was forced to become a “government” school. However, the upkeep of the land and buildings still had to be financed and serviced by the United Sisterhood. It was also necessary for the Sisterhood to subsidise the salaries of the teachers for many years. Although our jurisdiction over the school changed, our commitment to it never wavered. It must be clearly stated that we resented this take-over. ‘Black government schools’ were provided with very little other than school premises, an enforced syllabus and meagre staff salaries. Teacher qualifications were of no importance and anyone with a Std 6 certificate (8 years schooling) was eligible for employment at black schools. The Sisterhood recognised the need for a healthy, safe and uplifting school environment and channelled their energies and funds into providing needy children with food and clothing and to seeing that classrooms were maintained and painted. They provided as many teaching aids as possible and stocked the library with suitable books. During the following years, it became more and more difficult for the Sisterhood to provide services at the school, but they continued their sponsorship by feeding the children and supporting the staff and pupils on an ongoing basis. In November 1956, when the final bond repayment on the school was made, the event was celebrated with a party at the school and each of the 370 children were presented with a new school shirt. Even though the school had forcefully become a ‘government school’ the United Sisterhood still owned the school buildings and the land on which the school was built. 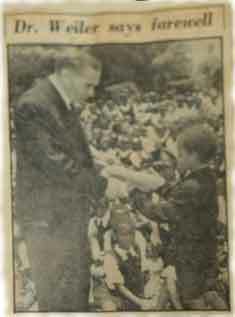 Before he left South Africa in January 1958, Rabbi Weiler visited the school to say goodbye to the 650 children. At a moving ceremony, these underprivileged children handed Rabbi Weiler Â£40 which they had collected for him. Deeply touched, Rabbi Weiler acknowledged this wonderful gesture and then handed the money back to the children as a gift. Despite the fact that the Sisterhood had to give up the official administration of the school, the buildings were leased to the Government and the income was used to sponsor the feeding scheme, clothing scheme, library, end-of-year parties and prize-giving. The 16th birthday of the school was celebrated at the end of 1961. On this occasion, the soccer team was fitted out with new soccer shorts and sufficient fabric for new school dresses for the girls was supplied by the Sisterhood. By 1963, the number of pupils had risen to 800 and there was a staff of 11 teachers, still under the diligent supervision of Hilda Phahle. Although the school was now administered by the Bantu Education Department, the Sisterhood continued to supplement the teacher’s salaries. A founding member of the Progressive Jewish Movement in South Africa, Jerry Idelson, spent many hours teaching the children new songs and training the choir. It was Jerry who composed the music for the MC Weiler School song, with the words written by Hilda Phahle. This song is still sung by the children today. In order to raise funds for the school, the Sisterhood planned a choral festival in November 1963 in which only Township children would participate. As it was not possible for white people to visit the township, this concert was held at Temple Shalom in Highlands North, Johannesburg. “The audience listened to music which, up to now, had only been associated with the large cities of the country. The children sang Jerry Idelson’s lovely composition set to the poem ‘Excelsior’ and poured forth songs in praise of the Lord in their vernacular, their voices echoing the glorious ‘Hallelujah’ of Handel.” (The Zionist Record, November 1963). This concert was a great achievement for Jerry, who trained these children almost to perfection. Part of the proceeds from this successful performance were used to purchase a generator to provide much needed electricity for the school which had, till then, limped along without this necessity. The balance of the money was used to establish a library at the Alexandra Secondary School, which had by now been ‘adopted’ by the United Sisterhood. The end-of-year party in December 1964 was very different from those happy parties that had been celebrated with the children of the MC Weiler school over the past 19 years. The party, which had been arranged to fall within the period of Rabbi Weiler’s visit to South Africa, was a sombre occasion. “There was a note of sadness in the voices of the children as they sang, and it was transferred to the audience.” (The Star, December 3 1964). The reason for this sadness was that the Bantu Education Department was planning to split up the school among several African schools on the Reef (now Gauteng). The Rand Daily Mail, December 17 1964, reported that the school would be disbanded as Alexandra would be cleared and its residents moved elsewhere. The Southern African Jewish Times, December 18 1964, reported that the Township was to become “a hostel for Bantu men”. Speakers on this occasion expressed sadness that, under the destructive Government plan for Alexandra, the largest primary school would be demolished. The Sisterhood, together with Mrs Phahle, decided to start fundraising for a new school building in Diepkloof. Fortunately, the dreadful plan to uproot the township dwellers never came to fruition! November 1965 was a triumphant celebration for the Sisterhood and the school. As they celebrated the 20th birthday of the MC Weiler School with 900 pupils, it was almost certain that the school would stay and that Alexandra had received a reprieve from destruction. Little did they know what lay ahead. Pupils from the Temple Emanuel Hebrew School in Parktown, under the guidance of Rabbi Dickie Lampert, collected funds to purchase 46 new school desks. Not only was this a wonderful gesture from the Progressive Jewish children, but it was also a most urgent need as in some cases, up to three children had to share one desk. The Bantu Education Board refused to supply these vital items of furniture for black children. On October 21 1966, the Progressive Jewish children sponsored a party for almost 940 children when the desks were delivered. The support from these children was not an isolated event – on many other occasions, they raised funds to support the school. In 1971, the Government once again thought of demolishing Alexandra Township and once again the fate of the school hung in the balance. This time it was suggested that the MC Weiler School be relocated to Meadowlands and that it’s name be changed. At this stage, some 34 years ago, the real battle for survival and a better education for the children started. Many petitions and complaints were lodged with the various Government Departments involved – these actions were not always beneficial to the Sisterhood status in the wider white community. In 1976, in accordance with the Group Areas Act of the time, which forbade whites to own property in black areas, the West Rand Administration Board expropriated the school buildings and the land on which they were built. At the same time, the Government was again thinking about whether or not to raze Alexandra to the ground and resettle it’s residents in Soweto. Such forceful moves of people from one area to another were not uncommon in South Africa in those days. By 1976, there were 960 children attending the school, which was still scattered all over in cottages, shops and other available premises. It was hoped that they could move into the recently vacated Holy Cross Convent next to the main MC Weiler School building and at last be housed under one roof. However this was not to be. During the 1976 unrest, the Alexandra High School was burnt down and its pupils were moved into the major part of the Convent building. All that was left were five dilapidated rooms that had neither floors nor ceilings. All concerned were grateful for the five extra rooms and once again, building operations and refurbishment had to begin. At great cost and with unflagging effort, five new classrooms, an office and a library were constructed with funds raised by the United Sisterhood. In the early 1980s, an organisation called “Alexandra Schools Association” was formed. 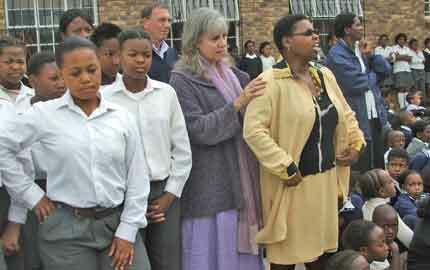 It’s aim was to find business organisations to sponsor each of the 15 schools in Alexandra. Within a short space of time, the Association had managed to find sponsors for most of the schools. These were, in the main, American companies subscribing to the Sullivan Code. The MC Weiler School could not find a business to ‘adopt’ it as the United Sisterhood was considered it’s official sponsor. At this particular time, the United Sisterhood was facing a grave financial crisis of its own. Their very existence was threatened due to a lack of funds and it was almost impossible to continue with all their other projects. Continual unrest in the township and the burning down of other schools made it even more difficult to get financial assistance. Fortunately Burroughs Accounting (Unisys) agreed to make an annual grant towards the work at MC Weiler School, although they could not adopt the school. Unfortunately, this annual grant came to an end with disinvestment and the departure of most American companies from South Africa in 1988. At this time, the overall condition of the school buildings had deteriorated alarmingly and by now the toilet block had become a real health hazard. In 1981, when Hilda Phahle retired after 36 years of unflagging effort, the school accommodated 1010 pupils, taught by 23 teachers in various buildings in five locations. In the same year, a pre-school class of 54 five-year-olds was started. This had been a dream of Hilda’s for many years. That year, Hilda was nominated as an ‘Unsung Heroine’ by The Star, but her dream of a new building to house all her scattered classes had still not been realised. In February 1982, Clare Herman who, for more than 20 years, had been the MC Weiler School Project Convenor, left South Africa to join her children in the USA. Her departure was a great loss to the Sisterhood and the school. 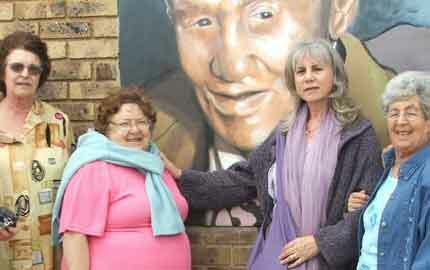 This devoted woman had been deeply involved with the school and was a constant source of encouragement to Hilda Phahle. Clare Herman also never saw her dream of the school under one roof realised. When Rabbi Weiler’s son, Major Adam Weiler, died in defence of Israel, the United Sisterhood decided to establish a scholarship in his honour. This scholarship was awarded to the top pupil leaving the MC Weiler School to continue with higher education. The first recipient to receive a seven year scholarship was Ezekiel Cebekhulu. 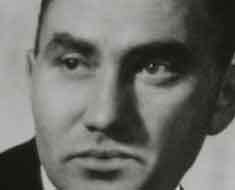 In 1983, the United Sisterhood changed the name of the scholarship fund to include the name of Gideon Weiler in order to honour Major Gideon Weiler, Rabbi Weiler’s second son to die in defence of Israel. It was only in 1984, when the new school building had been erected for Alexandra High School, that the Holy Cross Convent was vacated and the 1000 children of the MC Weiler School were at last housed under one roof. The building was in an extremely dilapidated condition and for the next seven years, the United Sisterhood carried on a running battle with the West Rand Administration Board and the Department of Education and Training to persuade one of them to take responsibility for the repair of the school. This they refused to do and not one cent was ever spent by either of them for improvement of the school buildings or grounds. Meanwhile the Sisterhood did what they could to make life pleasant for pupils and teachers. Teacher qualifications at black schools was of little importance to the Government. In 1984, most of the teachers at the MC Weiler School were not fully qualified. In 1987, Unidata sponsored a programme to upgrade the qualifications of the teachers. The first step was for the teachers to get their matriculation certificates in order to qualify for University entrance. Twenty teachers joined the programme and three years later, all had received their matriculation certificates. These teachers then went on to study for a Secondary Education Diploma at Vista University. By 1991, all had received their diplomas. Most teachers now set their sights on studying for a BA degree. Congratulations must go to the teachers on the wonderful effort they made. The United Sisterhood appreciates the sacrifices made in order to upgrade their skills and, by doing so, raising the standard of education of the children. Obtaining tertiary education was indeed an achievement for each and every one of these women who attended Vista University. In 1986, broken window panes and doors were replaced, classrooms painted and heaters provided. Application for electrical installations was made on an ongoing basis. (It was only in 1992 that electricity was supplied to the school.) The teachers painted the outside of the building with some delightful murals in an effort to create a friendlier environment for the children. However, despite all this, the overall condition of this already dilapidated building continued to deteriorate. “You cannot educate a hungry child” has always been the motto of the United Sisterhood, and since 1945, the feeding scheme at the school has always been a priority. The feeding scheme has now been running for more than 60 years with very few interruptions despite many difficulties. During the years when permits were required by white people to enter black residential areas, these permits were sometimes denied, and at other times, the unrest and violence made it too dangerous for our volunteers to enter the township. Despite all these problems, the United Sisterhood never abandoned the feeding scheme or the school, often at great personal danger to the volunteers. The Sisterhood was fortunate that many Christian women came to their assistance, especially the women of the French Embassy and Consulate who were able to obtain permits to enter the township. On occasion, these kind people not only prepared and distributed food, they also undertook to do the shopping. Fortunately, for the past 17 years the feeding scheme has run most successfully. However, without the support of Mazon – a Jewish response to hunger (an organisation in the USA), the Sisterhood would not be able to assist every hungry child. The United Sisterhood salutes all those who continue to contribute and gives special thanks those who supported them during difficult years, including Wanda Albinski and Berry Prentice, both women from a Christian organisation; Gabriella and her co-workers from the French Embassy in Pretoria, assisted by ladies from the French Consulate in Johannesburg, who managed to obtain permits and police escorts into the township to keep the feeding scheme going during the darkest years; and Martin and Andrea Janit who totally financed the feeding scheme for a number of years. Education for black children has always been of paramount importance to us, yet the Sisterhood never failed to understand the necessity for children to enjoy themselves. Black township children have very little exposure to this kind of activity. Very few of these children have ever experienced the joy of a birthday party, and for most of them there are hardly any Christmas celebrations due to the lack of employment opportunities for their parents. When the school was started 62 years ago, it was agreed by the founding members that the United Sisterhood would host a party and prize-giving at the end of every school year. This has been faithfully done and although there were years when members of the Sisterhood could not personally attend, as a result of legal restrictions or township violence, the party packs were prepared and ways and means were always found to get these to the school. Colddrinks, biscuits and sweets are still given to every child at the end of each year. Prizes are awarded to all the top students in the form of new school shirts. Realising how little the teachers earned in the early years, it became a tradition to give a hamper to each teacher at their end-of-year party. Needless to say, this small gesture to the teachers can never express the Sisterhood’s thanks for their efforts in educating the children with so much care and concern. It has always been the aim of the United Sisterhood to instil in the children at the school a life-long love of books. There has always been some sort of library at the school. In the early days, it was a shelf erected in a small room behind the Principal’s office, but it was always well stocked with a variety of books. In 1982, the READ Educational Trust appointed a co-ordinator to liaise with all the schools in Alexandra on an on-going basis. At first, box libraries were installed in the many classrooms scattered around the township. Eventually when the school was at last moved under one roof, a special room was set aside as a library. Money was raised for books, shelves were built, the room was painted and carpeted, strip lighting was installed and the room was also equipped with educational toys and bright and attractive posters. READ held special courses for selected teachers in many types of Library skills. A Festival of Books was held annually, highlighting story-telling, story-reading and dramatisation. In 1984, the MC Weiler School came first in the Story-Telling competition and tied with another school for first place in Story-Reading. The United Sisterhood is indebted to the wonderful READ co-ordinators who worked so closely with them in setting up and maintaining the high standards of the library. In January 1991, the Kovler Institute in America made a generous grant of $20 000 to the United sisterhood. The aim of the Kovler Institute is the furthering of relationships between blacks and Jews. These funds were used to refurbish the school. Broken floors and ceilings were repaired or replaced, cracked walls were restored, broken window frames were replaced and new doors were fitted. Classrooms were painted and repairs were made where necessary. Three years after this, the Department of Education and Training announced that a new building was being erected for the MC Weiler School. It is pleasing to know that other children from Alexandra would benefit from the refurbishment as it was almost certain that another school would be moving into the premises where so many years had been shared by the United Sisterhood, the teachers and the pupils. The vast majority of the learners at the MC Weiler School come from single parent families where an unemployed mother single-handedly carries the responsibility of caring and providing for three or four children. Today, the situation is more serious as many children are the heads of their families due to HIV/AIDS. To help these children, we send food parcels home for their siblings and provide the HIV/AIDS infected children with a protein-enriched breakfast as well as the nourishing lunch that is supplied to all those who are hungry. Several times a year, appeals are sent out by the United Sisterhood for monetary donations to “Our Children’s Fund” so that we are able to supply these lunches at the school. To supplement this, Cynthia Duchen launched a project whereby food is collected monthly at various Pick ‘n Pay stores. We express our gratitude to Pick ‘n Pay as well as to Cynthia and those collecting with her. As project convener of the MC Weiler School for 19 years, Henna du Plessis wanted to build a new kitchen for the school to replace the inadequate storeroom which was being used to prepare food. Henna is a true “Woman of Worth” who, with love and dedication, did so much to enhance and uplift the MC Weiler School. Her commitment to the school is unequalled and she will be sorely missed. We wish her well in her retirement. The kitchen project has been ably taken over by Belinda Katz, whose hard work and dedication has resulted in a beautiful new kitchen. This will not only be used for the hygienic preparation of food, but also as a ‘teaching centre’ to given women of the township the necessary skills to earn a living by baking. We thank our many donors who enabled us to turn Henna’s dream into reality. 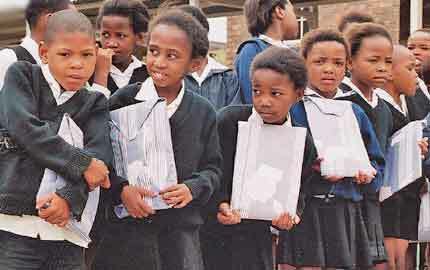 In 1996, the school catered for learners from Grade 1 to Grade 4 and approximately 890 were educated. 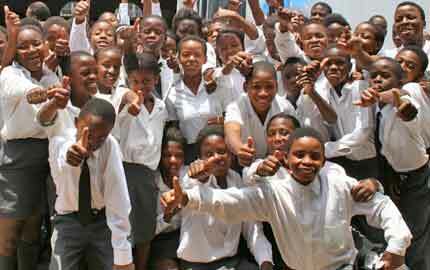 In 2004, three extra classes were added, and over 1000 learners are now taught from Grade R to Grade 6. Mary Buti, who became principal in 1983, retired in 2001 and Agnes Shibambu took over the reigns. On her retirement in 2004, Agnes was temporarily replaced by Nati Mnguni, and our current principal, Flake Ramothata, was appointed in May 2005. All who served in the position of head of the school were proud of the MC Weiler School and did all they could to promote its excellent standard. We thank them all. In 1996, many shacks in the area were demolished and the learners allocated to different schools. This initially caused a fall in the number of learners, but this has now risen again. After celebrating the 60th anniversary of the MC Weiler School in 2005, we look forward to 120th anniversary celebrations in peace and harmony.